Taiwanese heroic gore-shed time and welcome gain to the wonderful world of Taiwan movie buff and expert at putting entire scenes or entire movies in his movies: Chu Yen-ping. This episode, we talk of him dipping his toe into State Of Grace while also remaking it nearly fully and that work comes in the form of 1992’s Requital and 1994’s Hunting List. Click image or link below to access the show! Alan Tam double bill, people! Normally an actor I detest and for part of this episode I will continue doing that but no doubt, Tam-ster, Tam-boy, Tammi was part of a thriving Hong Kong cinema and put in various vehicles requring a lot out of him. Among other things action and for part of this evening, that admiration will be put forth. We first look at Wong Jing’s gun-fu, gunplay, Singapore set The Last Blood from 1991 and in the second half we discuss Sammo Hung’s politically incorrect action-comedy Pantyhose Hero. Click image or link below to access the show! 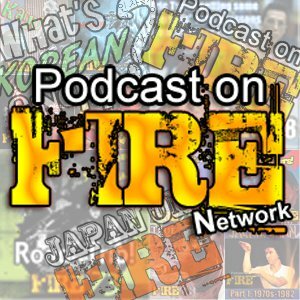 Podcast On Fire may focus on the known and the big guns out of Hong Kong cinema, classics or not, but no one’s demanding the programming to be strict or they’ll tune out so for this episode, based on the suggestion of our guest, we switch it up and head to part of the Hollywood filmography of a Hong Kong director. Namely John Woo and his third outing in America from 1997 called Face/Off. For our second review, we’re following among other things an actor on top of his game but not quite ready to be embraced by the public. Still, didn’t stop awards juries from giving Chow Yun-fat accolades for his performance in Leung Po-chih’s 1984 war drama Hong Kong 1941. With Kenny B and special guest Dr. Stan Glick. Click image or link below to access the show! We take a look at when the combo of martial arts, horror and the supernatural clicked, the genre bender if you will in the form of Sammo Hung’s Encounter Of The Spooky Kind from 1980 as well as the sequel to one of the most iconic Hong Kong action pictures of all time, John Woo’s A Better Tomorrow II. With Kenny B and Tom K-W. Click the image or link below to access the show!